Skin tags and moles are two of the most common types of skin growths which affect the skin and are in most cases visibly different. However, they are still often confused with each other. Knowing the difference between a skin tag and a mole and being able to distinguish between them is crucial to understanding which skin condition you have and being able to choose the right course of action. The main visible differences between a skin tag and a mole are their shape and color. Although these attributes may be interchangeable in some situations, we hope that after reading this you will have enough information to make a clearer distinction. A mole is a soft, small protrusion from the skin and is often found in areas that are exposed to the sun, although they most certainly can grow anywhere on the body. They are usually brown or black in color. Skin tags appear as an extra piece of skin and range in size from 1mm to 1 cm. In some cases even as large as 5cm but often they don’t grow larger than a grain of rice. The frequency at which skin tags appear and the number of skin tags are likely to increase with age, friction from activity, and weight gain. They are usually skin colored but can appear as darker protrusions. This is usually when someone may confuse them with moles. Another difference between skin tags and a mole is that a person can develop from 1 to hundreds of skin tags, while moles will usually range from 1 – 40 on any one person. The majority of moles lay flat on the skin, however, raised moles are also very common. The causes of why skin tags and moles appear also differ. Both are affected by internal and external factors. Thankfully, both moles and skin tags are considered harmless. Whilst moles need a little more care to ensure they stay that way, the presence of either a skin tag or a mole is no need for alarm or concern. The main similarity in the causes of both is genetics. This, of course, is just one possible cause of many. Let’s take a look at the causes of each. Friction: This is the most common cause of skin tags. You can see it from where they appear, such as the neck, armpits, eyelids, and groin. The rubbing against the skin causes collagen and blood vessels to get trapped and bunch. Diabetes: Having diabetes means the pancreas isn’t creating enough insulin to penetrate the cells. How this actually causes skin tags to form is still being studied. The appearance of skin tags is not always an indicator that you do have diabetes. If, however, you see a few appearing, you may consider getting your blood sugar checked, just to be safe. Weight Gain: Weight gain is one main cause of skin tags. Mostly because gaining weight also incorporates a few of the other causes, such as increased skin friction, and hormone and insulin imbalances. Hormones: When the hormones in your body are out of balance, whether it be from weight gain, pregnancy or any other possible bodily processes, it can cause skin tags to form. Even though the predominant hormone for men is testosterone and for women estrogen, things like gaining weight can cause these to imbalance and our bodies to create the opposite hormone. This leads to changes in the body and tissue build up, resulting in skin tags. Steroid Use: Steroid use causes the tissues in the body to build up quickly. This can easily lead to the development of skin tags. 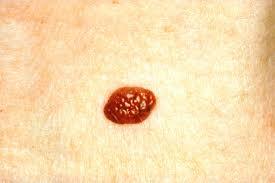 Skin tags may form from any age, ranging from babies into old age. They tend to form more frequently with age due to thinning skin and bodily changes. Moles develop when the cells responsible for giving pigmentation on the skin cluster together instead of normatively spreading across the top layer of the skin. Genetics: Some people are born with moles and some may develop over time as they get older. You can sometimes see within families that this gene for developing moles has been passed on to their children. Having moles is no reason to be alarmed. They should, however, be treated with some care when going out into the sun. Sun Exposure: The sun and it’s UV rays play quite an important role when it comes to moles. It can cause moles to develop and can also change the makeup of moles causing them to become potentially dangerous. Moles can appear as a single mole or in a group on various parts of the body. They will usually develop in the first 20 years of your life, during childhood and young adulthood. You may, however, continue to develop new moles well into adulthood. Moles themselves are also considered harmless, but in some cases can become malignant because they contain melanocytes that are vulnerable to developing melanoma. These melanocytes found on moles are living cells that respond to sunlight and UV by producing excessive melanin, giving them their darker color, and symmetrical shape. Over time some moles may not change but some may become raised and lighter. Unlike skin tags, moles may have visible hair growths on them. Any noticeable changes in symmetry or appearance of moles should be checked by a medical professional due to their ability to become pre-cancerous. When it comes to the removal of skin tags and moles, we also see some differences here as to how they should be treated. Cauterization – There are a number of cauterization products out there. Cauterization pens can be purchased fairly inexpensively which can safely be used on skin tags. If you are very prone to these skin growth, this could be a good purchase as they are rechargeable and can be used to effectively remove skin tags. Freezing – Using an instant flash freeze, skin tags can be removed easily with cryotherapy. With one application, you can freeze your skin tags, causing them to die and fall off. Ligation – With easy to use products like the TagBand, you can quickly and easily snap a small band around the base of the skin tag, which cuts off its blood supply and within a few days you will see it shrivel up and fall off. Salicylic Acid – Salicylic acid is a great option for removing skin tags. It is the active ingredient found in many of the skin tag removal products. It works by breaking down the skin cells of the skin tag. When it comes to the removal of moles, this we advise visiting your doctor for this. As moles lie more flush against the skin and do have the ability to become precancerous, it is best to visit your GP or dermatologist to remove them cleanly to minimize scarring. They will also usually send them to the lab for testing.